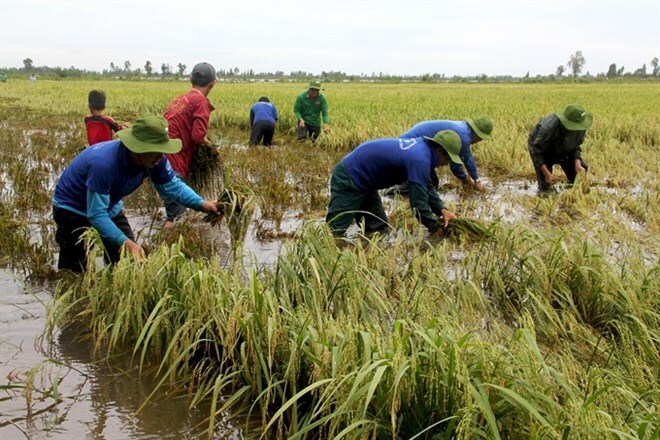 Long An (VNA) - Early season flooding and heavy rainfall have severely damaged thousands of hectares of rice fields in the Mekong Delta province of Long An. Water levels in the province hit 2.37m on August 4, 1.53m higher than the previous year’s figure. Water levels rose approximately 5-10cm every day. Among the affected localities, Tan Hung district suffered the most damage, with 2,400ha of rice field flooded, 125ha almost destroyed and 900ha forced to be harvested early which resulted in a significantly smaller yield, according to the provincial agriculture department. By the department’s estimation, another 3,000ha of rice field in the province faces flood threats should the water continue to rise. Farmers are scrambling to find desperately needed manpower to harvest their rice to minimise loss, with many farmers set to lose up to 5,000-6,000 USD.